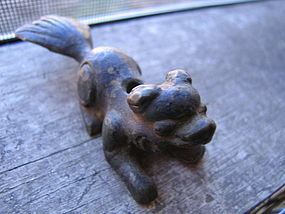 Vintage pagoda dog incense holder. It is 3 inches in length. This is older type solid brass. Due to the age, the surface has taken on a dark patina. The tail is slightly up on this piece, however, I have the mate to this one, with a lower tail. I need your zip code to calculate the postage.